This is the “Mitton House” in Bloomfield Hills, Michigan. Architecturally designed and built by Manley H. Mitton in 1962 on property he purchased in 1954. It has been expanded and remodeled considerable since the original structure was built. Manley Mitton died in 2005 but the house is still referred to as the “Mitton House”. 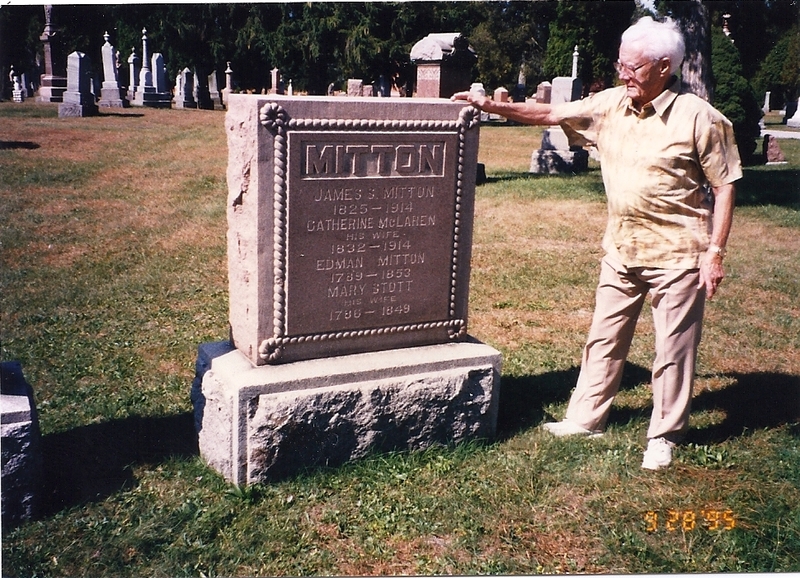 Manley H. Mitton (age 86 here) in front of the headstone of his great, great, grandfather Edman and great, great, grandmother, Mary Stott in Kent County, Ontario. Canada. It is they who emigrated to Canada in 1818 with their infant son John aka; “Grover John” who was baptized Aug. 9, 1818 at St. Oswald in Horton-in-Ribblesdale, England. Johns son was another Edmund aka, “Eddie the Clerk”. One of his sons was Urville Mitton, the father of the above Manley and the grandfather of the author of this research Bruce aka. “Bruce the great”.